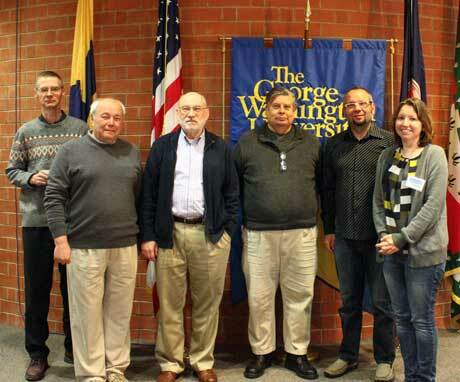 Dr. Bill Briscoe, fourth from the left, pictured with colleagues at a physics conference hosted on Campus in April 2015. Governor McAuliffe announced the appointment of Dr. William "Bill" Briscoe to serve on the Virginia Nuclear Energy Consortium Authority (VNECA). Dr. Briscoe became the first GW faculty member to serve on one of Governor McAuliffe's commissions. In 2013, the General Assembly passed legislation to create VNECA for the purposes of making the Commonwealth a national and global leader in nuclear energy and serving as an interdisciplinary study, research, and information resource for the Commonwealth on nuclear energy issues. The Commission is made up of executives from major nuclear companies in Virginia including Dominion, Huntington Ingalls, AREVA, B&W and Bechtel and faculty from the Commonwealth's leading research and education institutions. Dr. Briscoe is the only researcher representing a private institution in Virginia. “I am honored to serve the Commonwealth of Virginia as a member of the Authority. I am pleased Governor McAuliffe is taking action to position Virginia as a leader in nuclear energy,” said Dr. Briscoe. Thomas Jefferson National Accelerator Facility, Newport News, VA (most recent). Dr. Briscoe earned his Ph.D. in Experimental Nuclear Physics from The Catholic University of America in 1978 (MS, Northeastern, 1972 and BA, Catholic University, 1970). He was an assistant research professor for four years at the University of California, Los Angeles. He came to GW in 1982 as assistant professor, was promoted to associate professor in 1986 and professor in 1998.